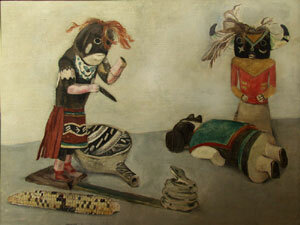 Stefan Hirsch, Kachinas, Oil on Canvas, 1929, 20" x 26"
Hirsch was born in Nuremberg, Germany to American parents. He studied art at the University of Zurich in Switzerland where he became involved in the Dada movement. In 1919, Hirsch moved to New York where he met Hamilton Easter Field, the great champion of modern art, who promoted his work. He also became involved with the Society of Independent Artists. During the 1920s Hirsh established himself as a painter and taught art. In 1929 he took a break from teaching and traveled in the Southwest. Hirsch married the artist, Elsa Rogo, sometime before 1931 when they made a painting trip to Taxco, Mexico. The next year Rogo became head of an art school for Mexican children in Taxco, but in 1934 the couple moved to Bennington, Vermont when Hirsch accepted a teaching position at Bennington College. Hirsch taught at the Art Students League from 1940 to 1946, and was chairman of the art department at Bard College from 1946 until the 1950s. Early in his career, Hirsch experimented with Cubism, but by the mid-1920s he was recognized as a Precisionist painter. Hirsh painted many industrial landscapes which were commentaries on the social and physical alienation of modern urban and industrial life. His Southwestern paintings emphasize the austerity of the desert landscape. In 1938, Hirsh won a Federal Art Project commission for a mural in the Federal Courthouse in Aiken, South Carolina. Justice as Protector and Avenger proved highly controversial because the central female figure representing justice was painted in slightly dark skin tones, and the judge was outraged at the "mulatto" in the painting. It was covered with a drape for many years.